Dead Space Extraction (DSE) - the latest on-rails shooter. Certainly a departure from it's predecessor (Dead Space, a space based survival horror), but is it any good? I'm going to be uncontroversial and say it's... fine, as all the reviews have said. There are a few game usability problems that really don't sit well with an otherwise pretty good game. 1 of the big attempts DSE makes is to introduce a feasible story into an on-rails shooter. 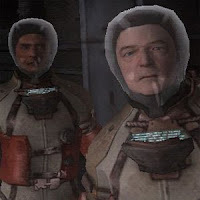 The story of survival against all the odds was a key part of Dead Space and there is an attempt to reproduce this here. The problem is a feature built into the game that rewards players who don't pay attention to the cut scenes - you can do better in the game by ignoring the story. Throughout play you are encouraged to key an eye out for items (such as ammo and weapon upgrades) you can 'grab' using a kinetic blog thing. These items can appear at anytime, during quiet periods, firefights and during cut scenes. The result is whenever you're not shooting, the best approach is to spam the 'grab' button at anything that isn't a blank wall. The net effect is that you spend very little attention on the story unfolding around you... or you risk missing out on loot. "Sorry - I don't care what you've got to say, get your head out the way of that cupboard..."
DSE should consider offering the option of playing the audio messages through the TV speakers. Another problem that should have been spotted is the occasional point where the game turns away from a creature too soon, leaving you open to attack from behind. You're facing the wrong way and the creature is repeatedly wacking you over the head... and there's nothing you can do about it. It just pulls you back to reality. An unwelcome reminder you're playing a game, and the game really shouldn't do that if it can possibly avoid it. DSE shouldn't turn away from creatures whilst they're still alive - you wouldn't turn away from them in real life anyway. The problem is at a couple of points you need to use a specific gun - the rivet gun. It's not clear you need to equip a different weapon if you have the wrong gun equipped. It took two tries at one set piece to understand what I was required to do. DSE could consider changing the aiming rectagle to clarify the difference between the guns, or include some clearer text when a gun is equipped. When the rivet gun is needed, and not equipped, ensure the player is made aware. The characters around the player could say something, or a message could appear on the screen. Having said all this, it's still a great game. It looks great, especially for a Wii game, the sound is good and voice acting more than sufficient (first time I've played a game featuring a Dutch accent). The story (if you attend to it) is good, it has a great shooting mechanics and some exciting set pieces. DSE is Aliens to Dead Space's Alien - a great fun shooting-fest... just don't expect to get too scared whilst enjoying the ride. How about you? What're your thoughts on the game?